Prior to co-founding Not On Our Watch with Ocean’s Thirteen cast members, Don Cheadle co-authored a book of the same name with human rights activist John Prendergast, offering background information about the Darfur crisis and how the public can help. 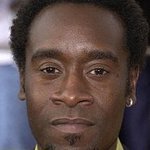 Google trends for "Don Cheadle"
This book by Kate Winslet benefits her autism charity, the Golden Hat Foundation, and features photographs of her celebrity friends. A book by Ocean’s Thirteen star Don Cheadle and human rights activist John Prendergast, offering background information about the Darfur crisis and how the public can help.